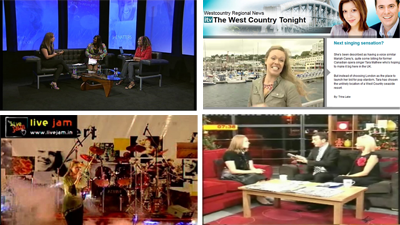 Tara has been interviewed many times on Christian TV around the world and has also performed on a number of occasions on UCB Televisions' UK Christian Music Chart Show, OHTV's music show, sung live on Loveworld TV, has videos featured on the 700 Club's website and has sung live on the ITV 6 o'clock News! Some of which can be seen below. Above left, Tara Mathew performing at Asia's biggest Christmas Event, Gloria Deo, which was televised and broadcast throughout Asia, The Middle East, The Far East and Australasia. On the right is an interview by British Christian TV (Revelation TV) about Tara's epic pop video, In Three Days, the first ever pop video to portray the resurrection that speaks to today's media orientated generation. The video can been seen below in full and is also part of an Easter Resource Pack develpoped by Tara. The video is also used in association with The Real Easter Egg, the only Easter Egg on sale that tells the Easter story! Below right is Christmas Present which is being released this Christmas in support of the Cardinal Winning Initiative. TV and live performances. Join Now!